Dennis Broderick only has one hive, but don’t let that fool you. He knows his way around bees pretty well. It all started in 2009 when Dennis was growing an heirloom garden and then, as these things do, it all snowballed. He got a worm farm. And a composter. And when he looked around he decided he needed more pollinators. 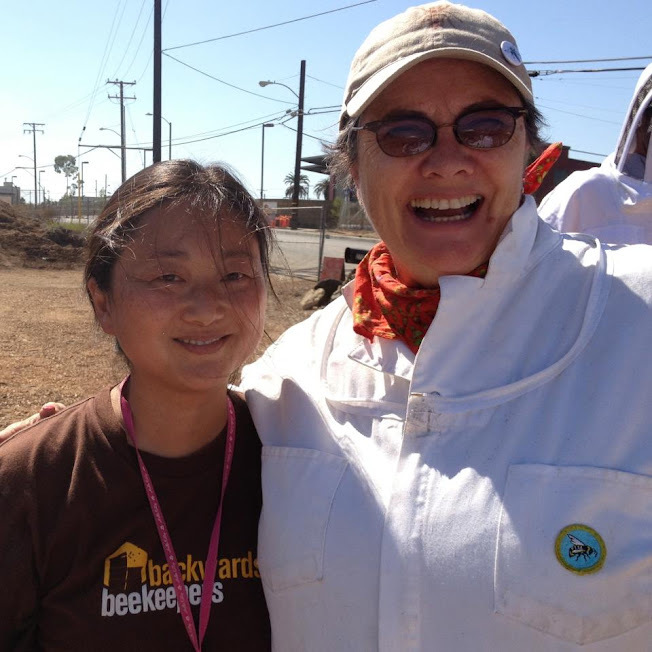 One day later he heard about the Backwards Beekeepers on KPCC and within a week Dennis had been to a meeting and was making arrangements with HoneyLove mentor Kirk Anderson to bring a swarm. Dennis also owns and shows Grand Champion Cairn Terriers. Better yet, he has his dogs Betty and Deuce in Earth Dog and Lure Coursing competitions because he believes that dogs not only need a job but that they should get dirty and have fun. Sounds a lot like bee rescue, doesn’t it? Say hello to HoneyLove’s 1st School Garden with Bees!! Yay Muir Ranch!! Another bee-utiful day up at the HoneyLove Sanctuary! Awesome NEW BOOK coming out featuring HONEYLOVE !!! HoneyLove outreach with three classes of curious, polite, awesome 2nd graders. Hive #1 (The Warrior Girls): old garage/barn structure in Woodland Hills. Hive #2 (The Mische Girls): upside down large pot in Northridge and a small citrus tree at the LA Times building. The small book Love in the Garden by Jean-Pierre Otte, contains a splendid eight-page poetical fantasy called “The Astonishing Deception of the Bee Orchid.” After reading it and learning how the bee orients herself through smell and gathers nectar to make an alchemical potion, I was quite keen on using the honey bee as part of the branding for my botanical perfume company. A few years later we witnessed a swarm arrive at the compost bin outside our studio, which started us on the path of urban beekeeping. The French bee historian Yvon Achard says, “Beekeepers are chosen by bees.” Indeed! We now have two active hives on our property. Thanks for the sweet buzz Living Homegrown ?!!! 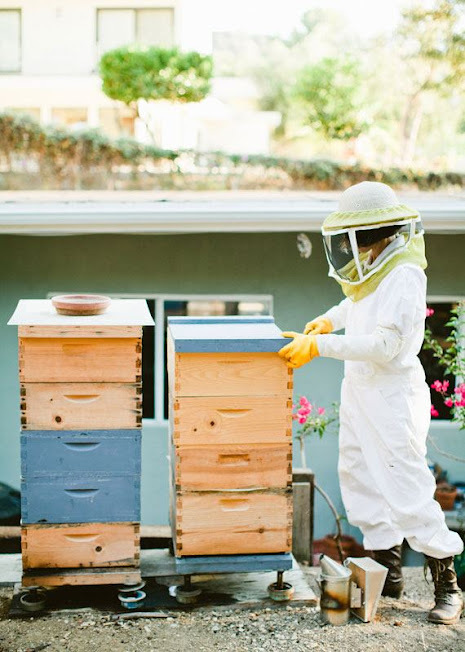 “Beekeeping started out just as way to improve my crops. Seemed easy enough to just get some free bees off a tree limb and stick them in a box and voila, more fruit. Well there was something about my first day that was just magical. I went to watch Kirk do a cutout with someone who had some experience. I came from work and they had gotten most of a very old and big hive out of wall. I got to just watch and learn. The next door neighbor and her kids were watching from a window and I loved being the person explaining what was happening. Kirk was mentoring, the other beekeeper was learning how to do a cutout, I was just learning how to be around bees and the kids were learning about something so new. Then Kirk took me to a simple swarm capture and we packaged them up into one of his old nucs and there I was with a new hive. With the swarm, it was just a small cute ball of fuzzy bees. They were gently, buzzing but pretty much content to go wherever we put them. Seemed like an innocent experience.